LONDON: Five-time Europa League winners Sevilla look set for another assault on the competition after Pablo Sarabia’s solitary goal earned a 1-0 away win to Sigma Olomouc in the first leg of their playoff on Thursday. Glasgow giants Celtic and Rangers are also well-placed to make the group stages, but Burnley’s first European adventure for 51 years looks likely to come to an end next week as they lost 3-1 away to Greek giants Olympiakos. New Sevilla boss Pablo Machin left hat-trick hero Andre Silva on the bench from Sunday’s 4-1 win at Rayo Vallecano, but Silva came on to make a vital contribution with a defence splitting pass that Sarabia prodded into the top corner six minutes from time. 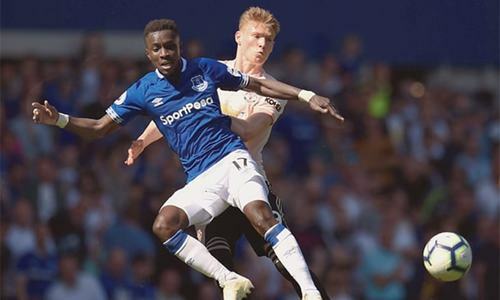 Burnley’s faltering start to the season both domestically and in Europe continued as they paid a heavy price for the sending-off of Ben Gibson on just his second appearance for the club. 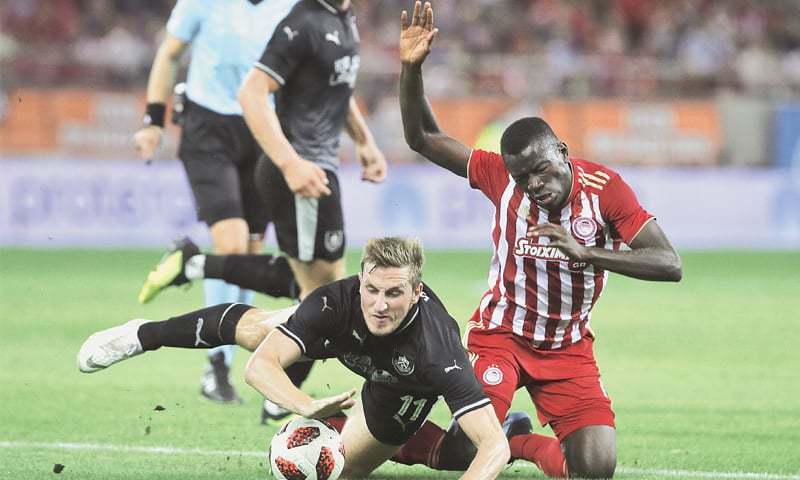 The former Middlesbrough defender was shown a second yellow card for a handball which resulted in Kostas Fortounis scoring Olympiakos’ third from the penalty spot on the hour mark. Chris Wood had cancelled out Fortounis’s opener before Andreas Bouchalakis restored Olympiakos’ lead. Celtic’s quest to put their Champions Lea­gue elimination at the hands of AEK Athens behind them got off to the perfect start against Suduva in Lithuania when Olivier Ntcham headed home on three minutes. But manager Brendan Rodgers bemoaned more woeful defending to allow Ovidijus Verbickas to head home an equaliser 10 minutes later in a 1-1 draw. are not giving away many chances but we don’t defend the set-piece well enough. Across Glasgow, Steven Gerrard has no such worries as his Rangers side registered a sixth clean sheet in 10 games under the former Liverpool captain in a 1-0 win over Russia’s Ufa. 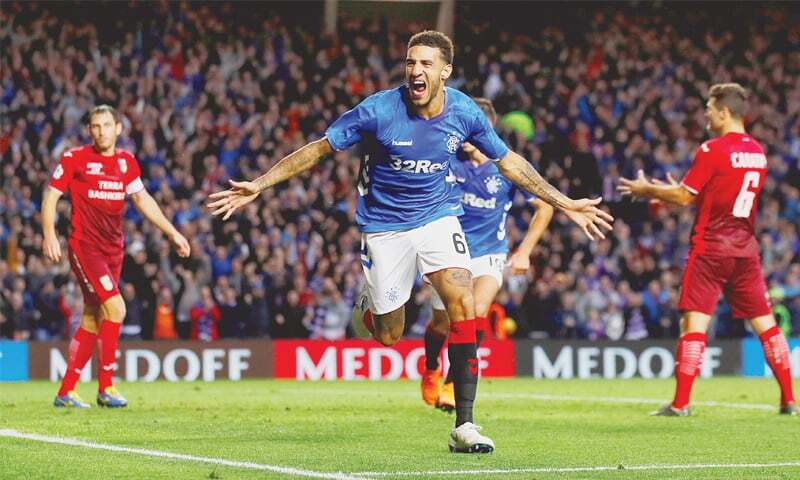 One of Gerrard’s centre-backs even got the solitary goal at Ibrox as Connor Goldson smashed home from close range. Rangers will carry a slender lead to Ufa in the autonomous republic of Bashkortostan next week and former England captain Gerrard said they would need a battling performance to reach the group stage of the tournament. “We won’t be getting carried away. We understand and respect the opposition and we need a performance full of heroes and warriors next week,” he told reporters. Zenit St Petersburg took a commanding 3-1 lead into their second leg against Norwegian side Molde with one of Russia’s World Cup heroes Artem Dzyuba inspiring a late comeback from 1-0 down in the final 20 minutes. Basel edged a five-goal thriller over Apollon Limassol to take a 3-2 lead to Cyprus next week thanks to a double from Ricky van Wolfswinkel. RB Leipzig still have work to do in Germany in the second leg after a 0-0 draw in Ukraine against FC Zorya Luhansk. Zorya, who finished fourth in Ukrainian Premier League last season, played the majority of the tie with 10 men after Bogdan Lednev was dismissed for a stamp on Marcelo Saracchi with just 15 minutes gone. Ricardo Jorge Pires Gomes and Tolgay Arslan scored for Partizan Belgrade and Besiktas respectively as the teams played out a 1-1 draw while managerless Girondins Bordeaux held KAA Gent to a scoreless draw by at Ghelamco Arena. And Champions League regulars in recent years APOEL Nicosia and Ludogorets Razgrad secured narrow 1-0 first leg leads over Kazak champions Astana and Torpedo Kutaisi of Georgia respectively.